Airtek’s new asymmetrically designed lift which provides the mechanics with ample door clearance to accommodate all passenger cars. This translates into lot of savings in terms of power, time and money. Applications Muffler Repair. Rust proofing operations.Transmission repair.Any other repair calling for a wheel-free condition. 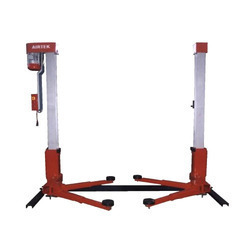 We provide our customer Two Post Screw Auto Jack, which helps to raise the motor vehicles to the convenient working. It is a special one to attend the transmission repairs, muffler repairs, wheel alignment, rust proofing operation, wheel conditioning and any other repairs in the under chassis of the vehicle. 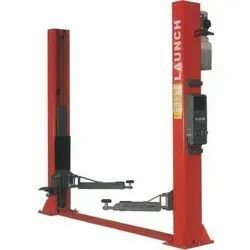 These are used to lift loads through short distance tolerates the load to be fixed as desired & holds it in its position without creep for indefinite period. catalogs attached for reference purpose .